No Way, Dude! 'Bill & Ted 3' Is On... Excellent! Bill & Ted are coming back. Never say never. After nearly 30 years it looks like another excellent adventure by Bill & Ted is coming to a theater near you. Bill and Ted themselves Keanu Reeves and Alex Winter took to social media Wednesday to drop the news. 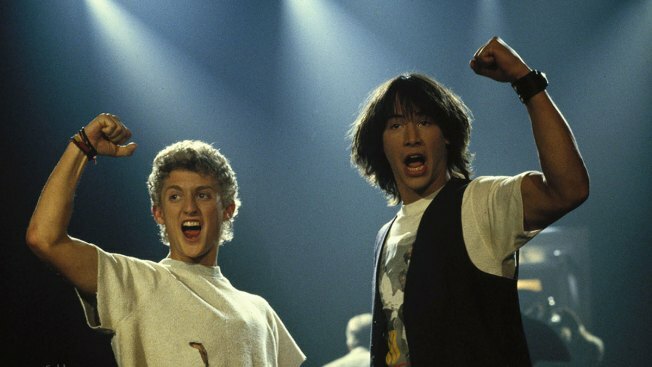 "It looks like we might actually, maybe make a movie this summer: 'Bill & Ted 3: Face the Music,'" Reeves announced. "It's all because of you guys," Winter added. "And we wanted to say thank you." The last Bill and Ted film, "Bill & Ted's Bogus Journey" was released in 1991. In the decades since Reeves went on to super stardom in films like "The Matrix" franchise, "Speed" and "Point Break." Winters has done much of his work behind the camera as a TV and film director.